Serving Collectors and Investors for Over 50 Years. Deal of the Day. 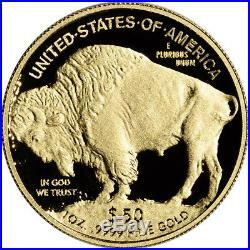 Created to compete with international bullion of higher purity, Buffalos are. 9999 (24 carat) bullion, as opposed to Americas pre-existing Gold Eagle at 91.67% (22 carat). 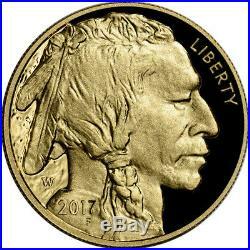 The design is a rendition of the classic U. Buffalo Nickel, with Indian head profile on the obverse and American Bison on the reverse. The “Stock Images” used in this description are an indicator of the quality of the item you will receive. The actual item you will receive is guaranteed to be as described and depicted. UPS 2 Day Air with Signature Confirmation. If you need to change the Address you should cancel your order and place a new order using the correct address. Bullion coins, bars and rounds are mass-produced and are not manufactured to the same quality standards as collector coins. Listed prices for bullion products are firm and not negotiable. Prices will change with movements in the spot price of the underlying metal while precious metals markets are open. Pre-Owned Vintage US Mint Products. Except for current year products, nearly all of our US Mint products have been previously owned. Unless otherwise disclosed, all of our US Mint products come with their complete original packaging. We inspect all pre-owned US Mint products prior to offering them for sale. We only sell sets that have passed our inspection; the coins are typically free of excessive hazing, spotting, or distracting toning. While the items are typically in very good condition for their age, these vintage products are not new. Use of Stock Images. We typically have multiple quantities available of many of our most popular products. As a result we often use “Stock Images” to represent the actual product. When a “Stock Image” is used to merchandise a product, that use will be disclosed as follows. The’Stock Images’ used in this Description are an indicator of the quality of the item you will receive. “Random Dates” Product Listings. When purchasing “Random Dates” products you can expect to receive dates and types of our choice, depending upon current stock on hand. Due to high volume it is impractical for us to select specific dates upon request. Liberty Coin attempts to display product images shown on the site as accurately as possible. However, we cannot guarantee that the color you see matches the product color, as the display of the color depends, in part, upon the monitor you are using. Prices and availability of products and services are subject to change without notice. Errors will be corrected where discovered, and Liberty Coin, LLC reserves the right to revoke any stated offer and to correct any errors, inaccuracies or omissions including after an order has been submitted and whether or not the order has been confirmed. Since 1965, Liberty Coin has offered an ever-expanding line of precious metal bullion, collectible coins and US Mint products. Whether you are an investor seeking asset diversification through precious metals, an experienced collector searching for a key date coin, or simply trying to find a vintage Proof Set as a gift, Liberty Coin’s extensive inventory is available to meet your needs. To contact Liberty Coin. Sign up to receive special insider notifications of deals, promotions, and new items! Powered by Solid Commerce The All-in-One Listing, Inventory & Order Management Solution. 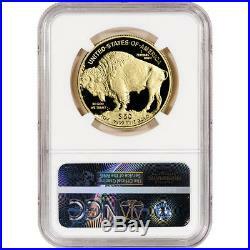 The item “2017-W American Gold Buffalo Proof (1 oz) $50 NGC PF70 UCAM Early Releases” is in sale since Wednesday, July 19, 2017. This item is in the category “Coins & Paper Money\Bullion\Gold\Coins”. The seller is “liberty.coin” and is located in Huntington Beach, California. This item can be shipped to United States, United Kingdom, Denmark, Romania, Czech republic, Finland, Hungary, Malta, Australia, Greece, Portugal, Cyprus, Japan, Sweden, Indonesia, Belgium, France, Hong Kong, Ireland, Netherlands, Poland, Spain, Germany, Austria, Singapore, Switzerland, Norway, Saudi arabia, United arab emirates, Qatar, Bahrain, Malaysia, Brazil, Barbados, Bermuda, Brunei darussalam, Ecuador, French guiana, Guernsey, Gibraltar, Iceland, Jersey, Cayman islands, Liechtenstein, Luxembourg, Monaco, Macao, Martinique, Maldives, Oman, Peru, Paraguay. 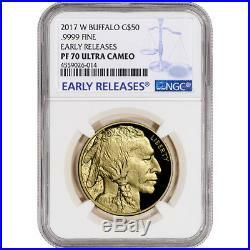 This entry was posted in 2017-w and tagged 2017-w, american, buffalo, early, gold, pf70, proof, releases, ucam. Bookmark the permalink.